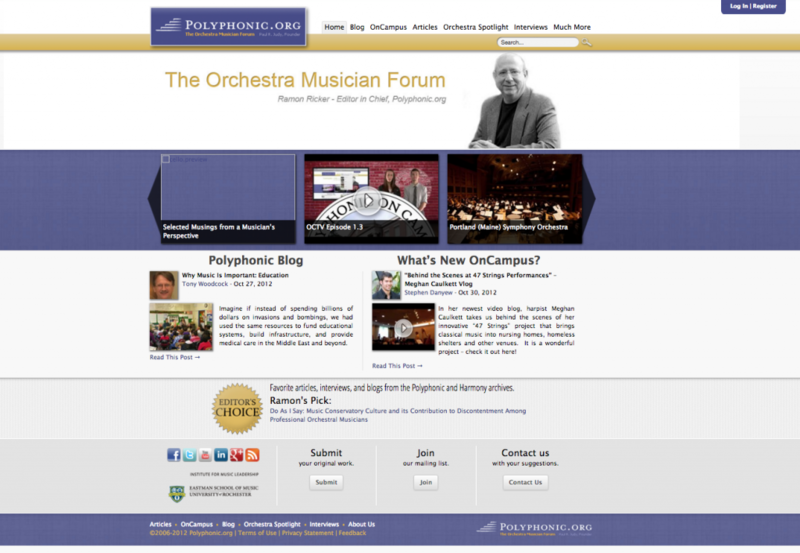 Polyphonic.org was the first technological venture of the Orchestra Musician Forum of the Eastman School of Music. For over 9 years, it has served as a community for musicians all over the world to discuss anything about music including life as a musician, the state of the music industry, different orchestras, and much more. Polyphonic has since been archived to remain as a resource to musicians everywhere. In 1994, Paul R. Judy launched the Symphony Orchestra Institute (SOI), with a mission to foster positive change in how symphony orchestra organizations function in order to improve their effectiveness, to enhance their value in their communities, and to help ensure their preservation as unique and valuable cultural organizations. The Symphony Orchestra Institute published Harmony – its journal dedicated to sharing knowledge and ideas among practitioners, scholars, and others. 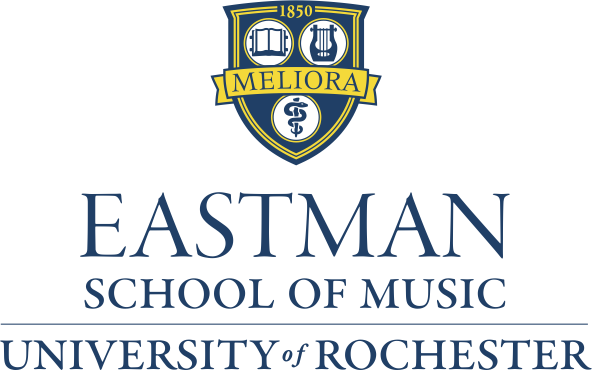 The SOI conveyed its programs and assets to the Eastman School of Music in 2005, based on the judgment that it is the best positioned and most able of the nation’s music schools to carry out its mission. Eastman established the Orchestra Musician Forum (OMF) to serve as the home for this work. The mission of the OMF is to contribute to the professional growth, career advancement, and organization participation of career musicians in North American symphony orchestras and alternative ensembles through a range of educational and informational services. In 2006, OMF’s first technological venture was the release of the website Polyphonic.org. Its goals were to provide musicians with new skills and insights in a learning community, which together will enable them to become more involved and contributing stakeholders in musical arts organizations. The Editor in Chief was Dr. Ramon Ricker, the Director of the Institute for Music Leadership. Assisting Dr. Ricker in the planning of the website, writing of content, and review of external content were Senior Editors Ann Drinan and Drew McManus. It strived to strengthen connections with other professional musicians, participate in discussions about the musical world, and much more. Polyphonic quickly grew into a popular resource for musicians. 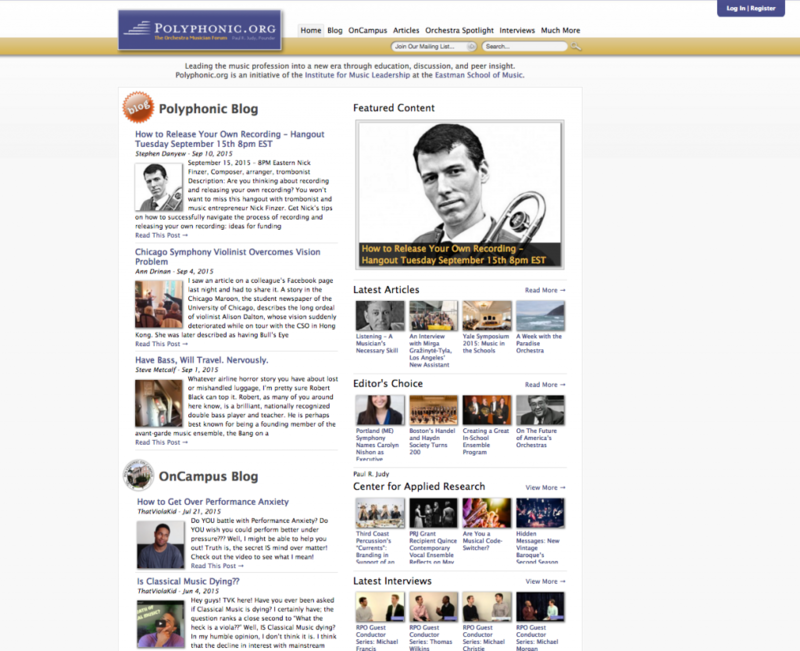 Professionals were eager to write articles and participate in discussions for Polyphonic.org, and the website quickly established itself as a reputable source of information for musicians. Polyphonic created an online archive of the previously published Harmony journals, and also presented regular articles on a variety of topics, virtual discussion panels, video interviews, and in-depth orchestra spotlights. Yvonne Caruthers, Laura Brownell, Robert Levine and Ann Drinan served as Senior Editors. 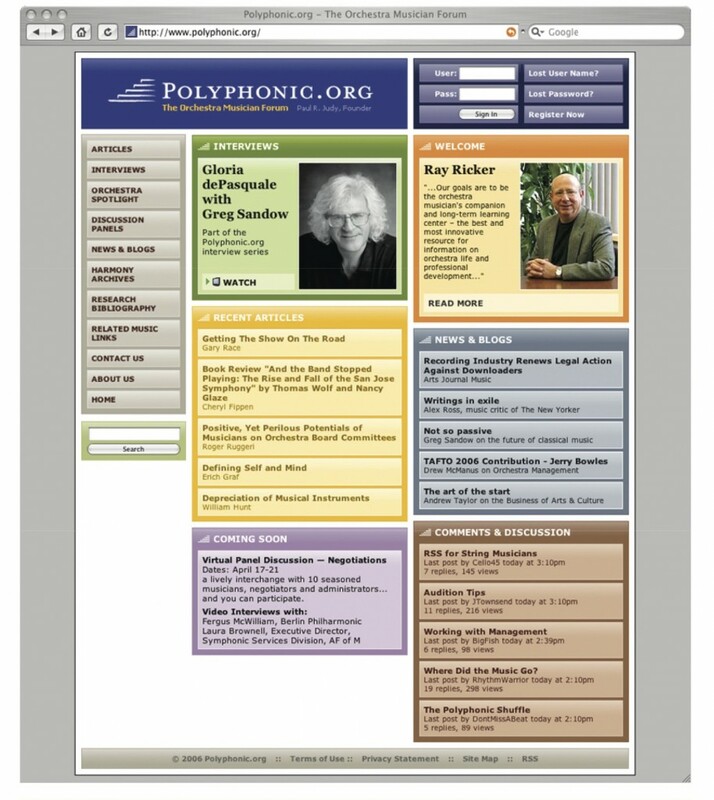 In 2009, Polyphonic.org started its blog at the urging of Robert Levine, continuing its mission to be an invaluable and up-to-date resource for musicians. Numerous writers contributed to the blog, making it a robust source of news, commentary, and insights for the field. In 2009, with a desire to expand its reach, Polyphonic broadened its focus and created Polyphonic OnCampus—an area of the website designed by and for young musicians. It offered students and young professionals the opportunity to engage and interact with their peers. It focused on OnCampus TV, Vlogs, Webinars and Hangouts, OnCampus Articles, and OnCampus Resources. ESM alum Steve Danyew was added to the Polyphonic team to help manage the OnCampus section. Philanthropist Paul R. Judy made a $1 million commitment to establish the Paul R. Judy Center for Applied Research. The PRJ Center’s research and programming emphasizes the 21st century evolution of the innovative ensemble, influenced by both the symphony orchestra and the chamber music traditions, with a focus on creative, artist-centered ensembles that reflect new models of artistic innovation, organizational relationships, and operational sustainability. 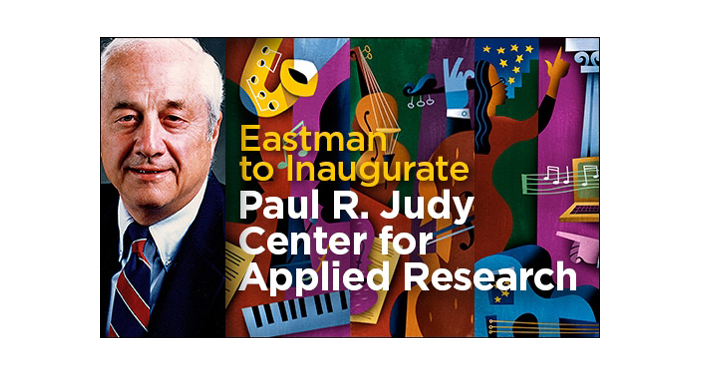 The Paul R. Judy Center encourages scholars to engage in a new field of research, one that focuses on innovative ensembles, their business models, and their impact on contemporary culture. This research will provide the basis for new courses and experiential learning opportunities for young musicians. The Paul R. Judy Center also serves as an incubator for emergent innovative ensembles. In the summer of 2015, Dr. Ramon Ricker retired from the Eastman School of Music, and James Doser became the new Director of the Institute for Music Leadership, and the Editor in Chief of Polyphonic.org. Polyphonic.org and The OMF now resides within The Paul R. Judy Center for Applied Research, which continues to offer its services and resources to the Eastman School, as well as musicians and musical arts organizations around the world.